The study of linear ordinary differential equations (ODEs) with parametric coefficients is an important topic in robust control theory. A central problem is to determine parameter ranges that guarantee certain stability properties of the solution functions. We present a logical framework for the formulation and solution of problems of this type in great generality. The function domain for both parametric functions and solutions is the differential ring D of complex exponential polynomials. 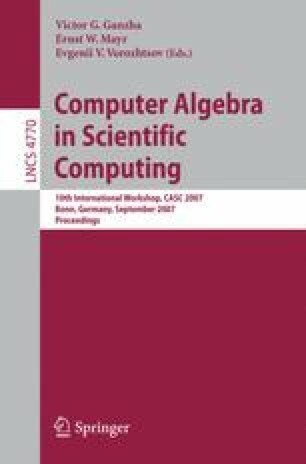 The main result is a quantifier elimination algorithm for the first-order theory T of D in a language suitable for global and local stability questions, and a resulting decision procedure for T. For existential formulas the algorithm yields also parametric sample solution functions. Examples illustrate the expressive power and algorithmic strengh of this approach concerning parametric stability problems. A contrasting negative theorem on undecidability shows the boundaries of extensions of the method.